Elijah Davidson, his brother James and his brother in law, Peter Butler served in Captain Gorin’s Company, with the Kentucky Mounted Volunteer Militia’s 10th Regiment, Commanded by Col. Philip Barbour fought at the Battle of New Orleans in 1812. Veterans of the War of 1812 begin receiving 160-acre land warrants in the Illinois Military Tract, a region between the Illinois and Mississippi rivers, in 1829, when the Chippewa, Ottawa, and Potawatomi ceded lands in northern Illinois by treaty at Prairie du Chien. 1829 Elijah and extended family leave Kentucky for newly opened lands of western Illinois. The Davidsons Murphys and Butlers locate on the south side of Cedar creek, which runs to the north of the town of Monmouth. At this time, the entire territory, contains only thirty families. 1829 In Autumn, Elijah Davidson, William Whitman, Peter Butler and others on the south side of Cedar creek. By this time the entire territory comprised in Warren, Henderson and Merger counties contained only about thirty or forty families; but others were constantly coming, so that by the spring of the latter year it was thought proper to send to Peoria and secure an order for a county election. 1831 On the 30th day of April, Elijah Davidson is appointed pastor of the Christian Church establish at Cold Brook, east of Monmouth. The Cold Brook congregation calls itself "the church of Christ on Cedar Fork of Henderson River. The first group met originally in members' houses, the courthouse, and a hallway of a downtown building. Elijah also served as the County Treasurer. The spring of 1832 opened rather late, the weather was cold, and, like the previous spring, but little corn came up. the settlers had taken the precaution, however, to procure a species of Indian maize, known as corn, which matured much earlier than the common variety, and that season a very good crop was raised. The National Road, that began in 1811, was a highway that reached Vandalia, Illinois. It was the first federally funded road in U.S. history. George Washington and Thomas Jefferson believed that a trans-Appalachian road was necessary for unifying the young country. In 1806 Congress authorized construction of the road and President Jefferson signed the act establishing the National Road. It would connect Cumberland, Maryland to the Ohio River. The road had become an important linkage between the original 13 states and the new states created in the Louisiana and Northwest Territories, in the wake of the Treaty of Ghent and the Adams-Onis Treaty. The treaties and subsequent National Road "aided whites and brought misery to the Indians" (Black Hawk’s War). The Louisiana Purchase and Adams-Onis Treaty took Spain's protection away from Indians, and the War of 1812 removed British protection over them north of the Ohio River. As the white population of the region grew so do the tensions with the Native American population. 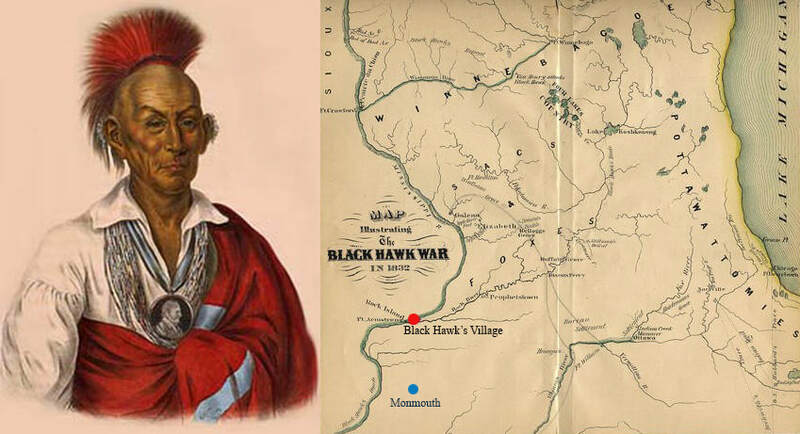 Determined to resist the growing presence of Anglo settlers on traditional tribal lands, the Sauk warrior Black Hawk is drawn into war with the United States. As the U.S. Army built more forts and droves of settlers moved into the territory, Black Hawk grew increasingly angry. Finally, in 1831, settlers began to occupy the village of Saukenuk, an area that would later become Rock Island, Illinois. Regardless of the provisions of the treaty, Black Hawk refused to leave his own home. He began to prepare for war. Chief Black Hawk leads a group of Native Americans back east across the Mississippi River to reclaim land previously ceded to the US Government. Early in 1832, General Edmund P. Gaines arrived in the area with a sizable force of U.S. soldiers and Illinois militiamen. Initially, Black Hawk withdrew his large band of warriors, women, and children to the west side of the Mississippi. On April 5, however, he led them back into the disputed territory, believing that other Indian forces and the British to the north would support him in a confrontation. The following day, a large army of soldiers caught up to Black Hawk and his followers near the Rock River of northern Illinois. When neither the British nor his Indian allies came to his support, Black Hawk attempted to surrender. Unfortunately, one of his truce bearers was killed in the confusion, and the Black Hawk War began. 1832 In the spring, the citizens of Monmouth’s crops barely planted, news of an Indian war arrives, less than 60 miles away. Black Hawk and his band were on the warpath and Black Hawk's band has defeated a local militia at the Battle of Stillman's Run. ​Elijah Barton Davidson Jr. joins the Illinois militia and fights in the Black Hawk War, as does another young man named Abe Lincoln. The Battle of Bad Axe, the last major battles during the Black Hawk War, was fought between the combined forces of the Sauk (Sac) and Fox tribes and United States Army troops under Gen. Henry Atkinson. The battle marked the last conflict east of the Mississippi River. Following the Battle of Wisconsin Heights, Sauk (Sac) and Fox forces (referred to as the "British Band" as a distinction between pro-American forces) fled westward across northeastern Illinois and southwestern Wisconsin from the pursuing Gen. Henry Atkinson's troops, consisting of members of the Illinois and Wisconsin militia. Reaching the mouth of the Bad Axe River and Mississippi Rivers near present day Victory, Wisconsin, the tribes were forced to halt their retreat as, intending to escape across the Mississippi, they began to construct bark rafts to transport the 500 men, women and children across the river. On the afternoon of August 1, 1832, however, as the rafts were nearing completion, the steamboat Warrior arrived with U.S. troops. As the tribes attempted to surrender, due to a miscommunication, the commanding officer, a Lt. Kingsley, ordered troops to open fire at the approaching tribesmen, which instigated the battle. After two hours, the Warrior withdrew from battle due to lack of fuel and returned to Fort Crawford at Prairie du Chien, Wisconsin, leaving twenty-three tribesmen dead. Despite Black Hawk and the Winnebago prophet White Cloud's advice against the long process of stripping elm trees and cutting timber (with Atkinson's forces only 10 miles behind them), instead advising to head north and find refuge with the Winnebago, the majority of the tribe chose to continue constructing rafts as Black Hawk left with thirty to forty followers upriver. The following morning, the remainder of the tribe was met by Atkinson's forces, which, with Col. Henry Dodge, launched another attack. With the confusion among the mass of fleeing Sauk and Fox, as well as a number of non-combatants including women and children hiding in the surrounding forests and underbrush, over one hundred and fifty members of the tribe were killed and around seventy-five were taken prisoner with minimal losses by US forces. Although some were able to escape across the river during the fighting, they were soon attacked by Sioux war parties in Iowa. The battle would end the Black Hawk War but would be remembered as a massacre. As subsequent generations of Indian fighters would learn, however, the mighty force of the U.S. government was relentless. On August 2, U.S. soldiers nearly annihilated Black Hawk’s band as it attempted to escape west across the Mississippi, and Black Hawk finally surrendered.